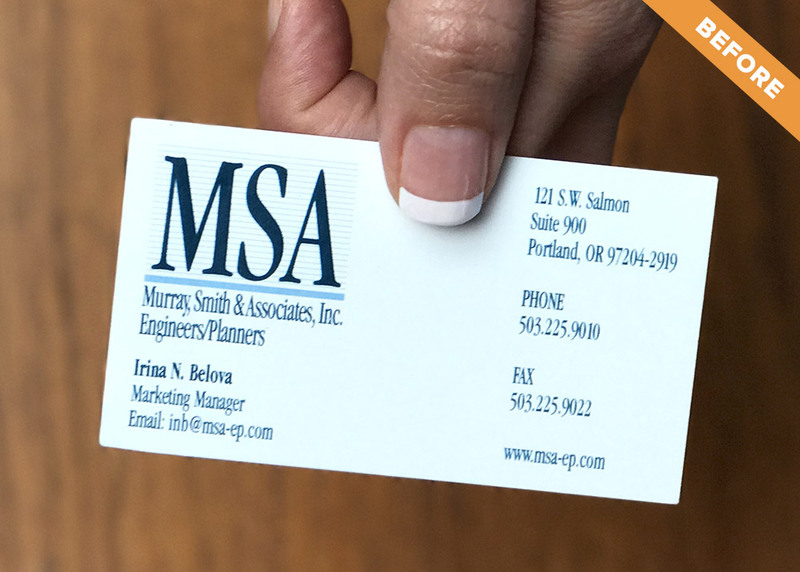 After speaking at the SMPS Pacific Regional Conference in Portland, Irina approaches me saying, “I read your article on AEC rebranding in the PSMJ Newsletter.” Upon handing me her business card, she confesses, “I know, we need your help.” Irina’s card reads Marketing Manager at Murray, Smith & Associates, Inc. (aka MSA) an 8-office, 120-person civil engineering firm located in Oregon, Washington, and Idaho. While Irina’s Marketing Department understands the value and need for branding, many of the firm owners are reluctant to invest in a rebrand when “business is good, why should we change?” Plus, an attempt at DIY rebranding, and hiring a consultant unfamiliar with A/E/C marketing, had both failed. 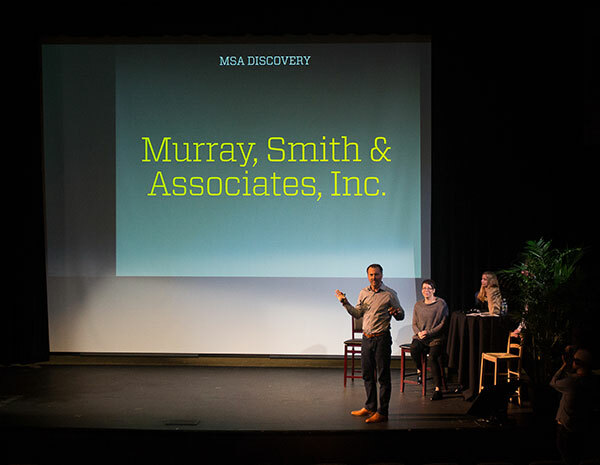 The use of two brand names, MSA and Murray, Smith & Associates, Inc. confuses those unfamiliar with the firm. 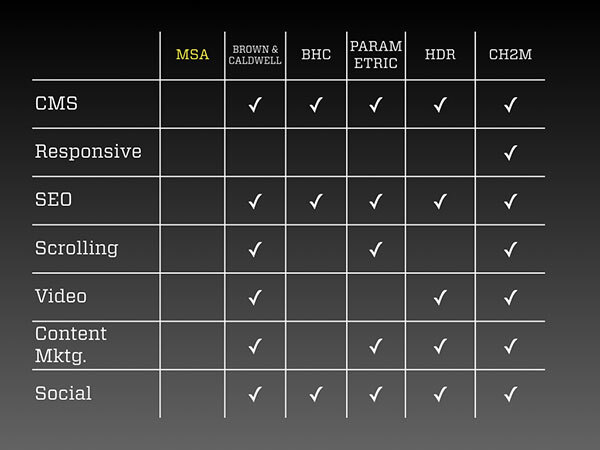 The acronym MSA is generic, lost among AEC firm alphabet soup names. With no Murray, Smith, or Associates at the firm, this name doesn’t reflect where the firm is headed. In short, two names and both are weak. 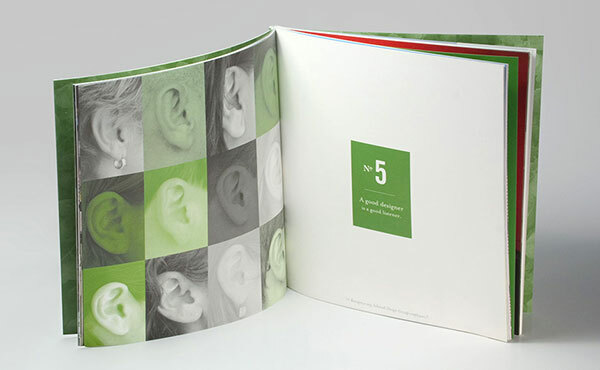 Internal and external feedback reveal a brand identity that has gone stale. Compounding the problem are the inconsistent versions of the logo (see above). The horizontal lines behind MSA in the logo are problematic at small sizes and when reversed out (white on dark backgrounds). The only thing that everyone at MSA agrees upon is that the website is terribly outdated (see above). The competitive audit (see below) reveals how much the site lacks in terms of modern website attributes. I fly to Portland to share the Findings & Recommendations and Why Branding Matters in a presentation to the owners. The room is filled with mostly smiles and heads nodding in agreement, but there are a few owners with folded arms still reluctant to move forward. The proposal to rebrand is ultimately approved, but for a novel reason. MSA’s rationale for rebranding is not to attract new clients, but specifically to attract and retain talent. I share that the two are not mutually exclusive and that the work we do to attract and retain talent will also benefit marketing and business development. A strong brand is rooted in solid brand strategy. 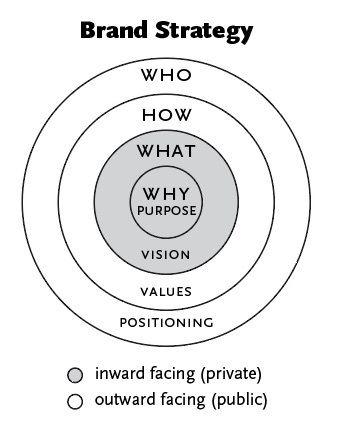 This means having well-articulated Purpose, Vision, Core Values and Positioning statements. 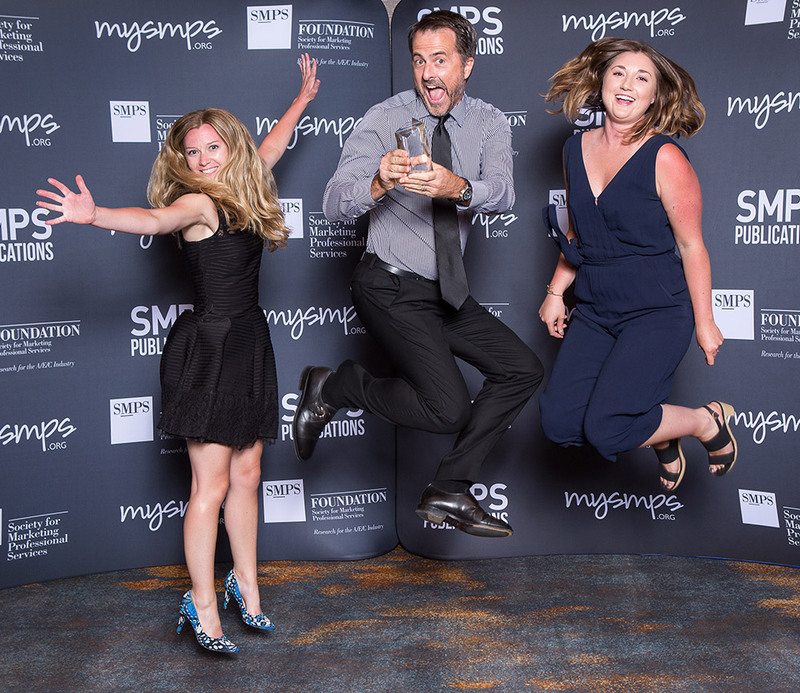 We are large enough to employ diverse talent to solve your biggest challenges, yet small enough to genuinely care. Our people are like super glue. They tend to stick around awhile. And that’s some strong stuff, which means you get a strong team. We take care of our people so they can take care of you. We are personally invested in your success ““ for the long term. Not just for your next project. As your projects and challenges evolve, we’ll still be by your side. As an extension of your staff, we’ll work together to help our community prosper. From these three uniques, we develop the following positioning statement as seen on the home page of our new website. 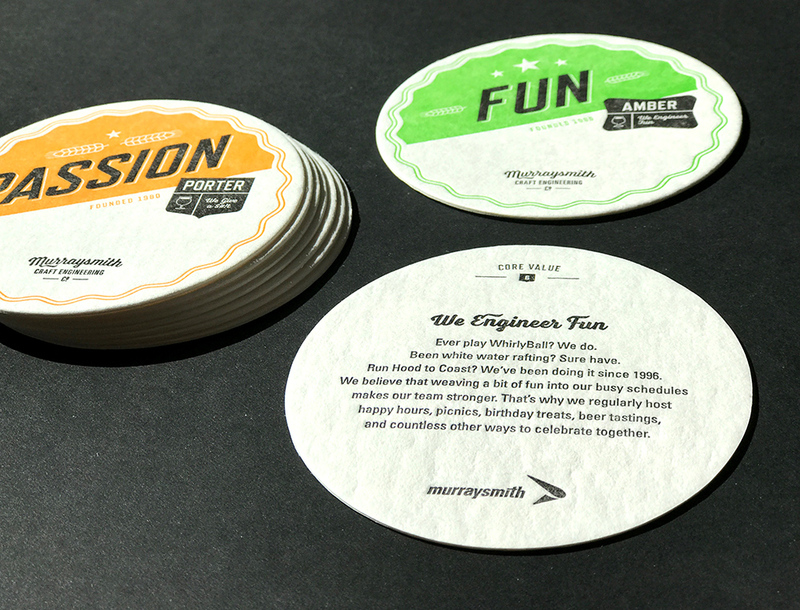 Our workshop yields seven Core Values that we later expand upon and manifest as a faux craft beer coaster for each of the seven Core Values. 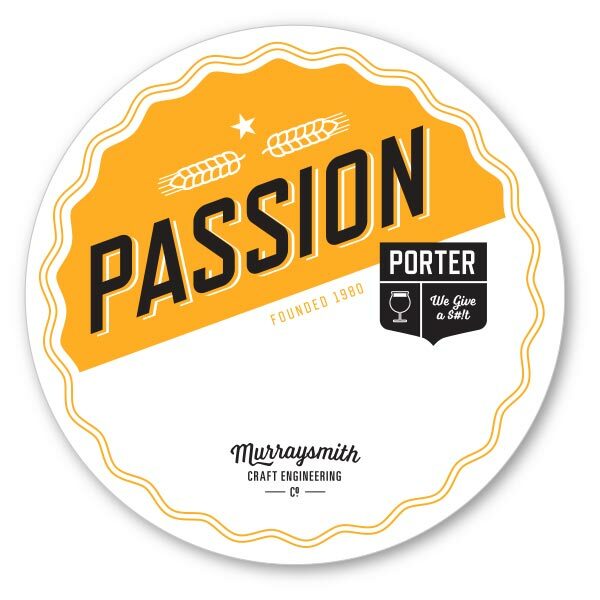 Why craft beer coasters? We draw from Just the Right Size, Our Work Goes on the Fridge (Obsession with Quality) and focus on the Northwest. 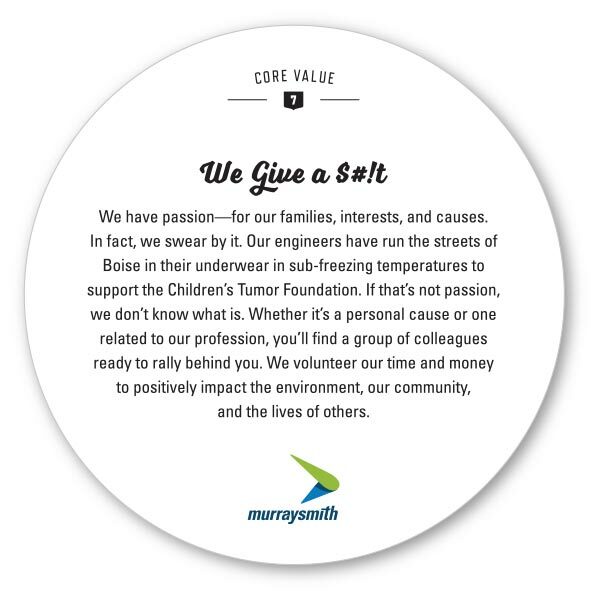 Each of the seven Core Values is letterpress printed (a craft printing technique) with the value on the front, and more detail about what the value’s meaning on the back. 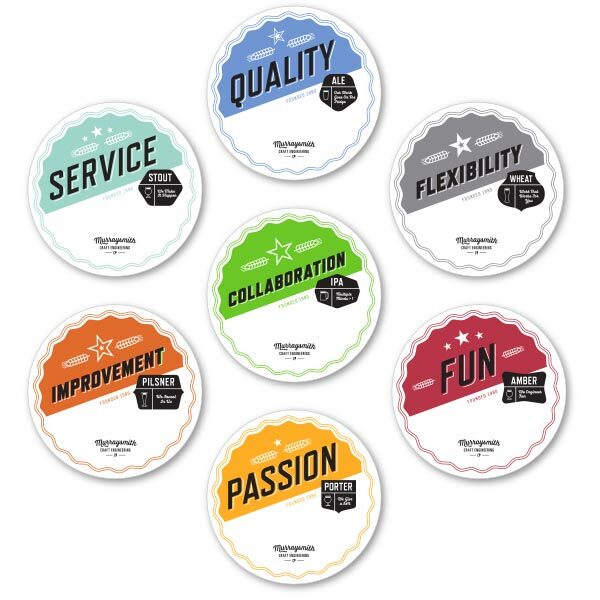 To give each value the gravitas it deserves, and to create a sense of anticipation, we recommend the distribution of one new Core Value coaster to each employee for seven consecutive weeks. We begin sketching rough logo ideas, which get drawn digitally in Adobe Illustrator, then refined, and presented as 7 explorations in grayscale. 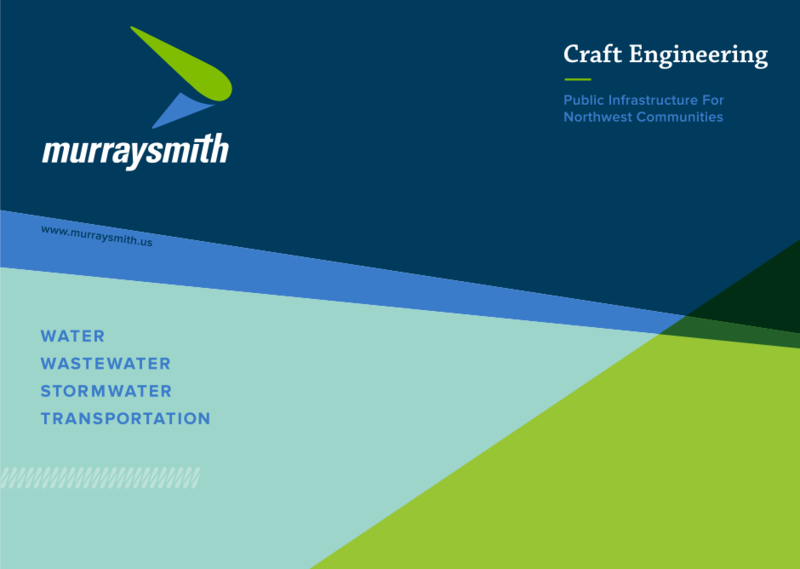 Based on feedback, we refine three finalists in color and show what the logo might look like on a business card. The final logo design evolves from prioritized aspects of the Core Values, Positioning Statement, and Brand Personality attributes. 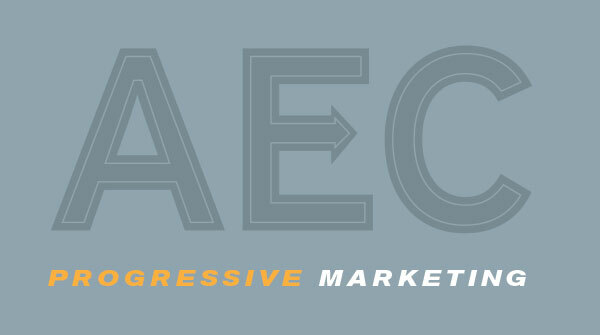 For example, We Make It Happen, is represented by the forward moving arrow shape and right-leaning wordmark. With a focus on the Northwest, the green “pin” within the arrow points to the northwest corner of the United States. 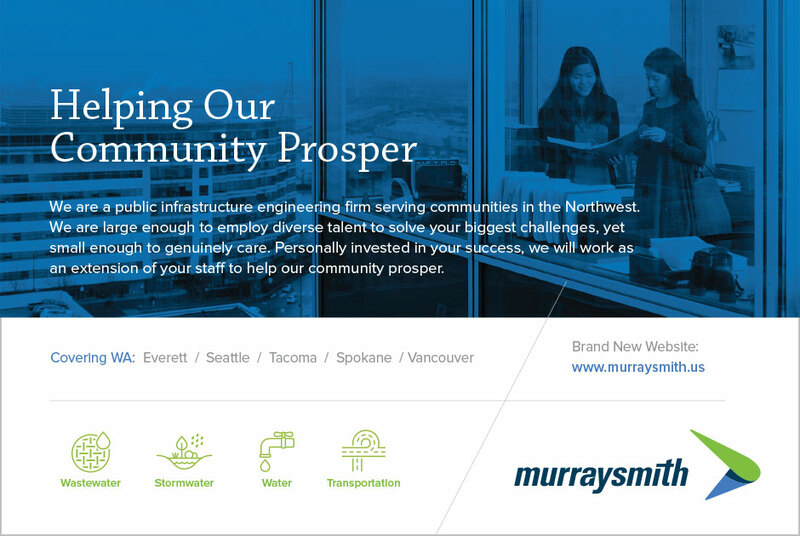 Being relatable and sincere, we choose lowercase, sans-serif typography for the custom wordmark that reads “murraysmith.” To retain equity from the past, the logo uses legacy colors in use for the past five years. 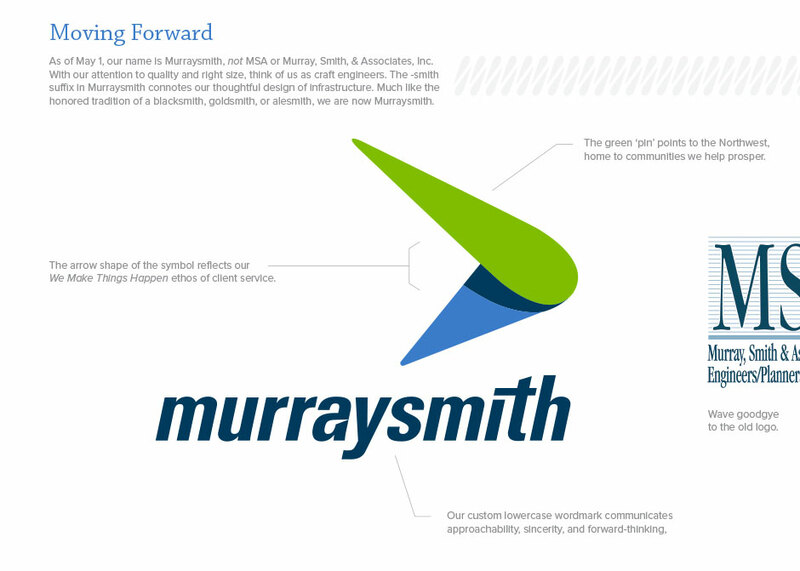 While elements of the logo have meaning, we purposely design an overall abstract symbol that, as Murraysmith continues to deliver on their promises, will gain meaning over time. Now the approved logo is ready to be applied to brand touchpoints. 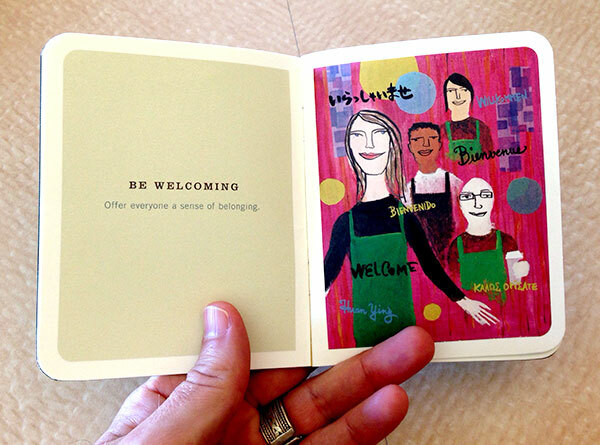 We start with the business card because of the challenge to design in such a small space. 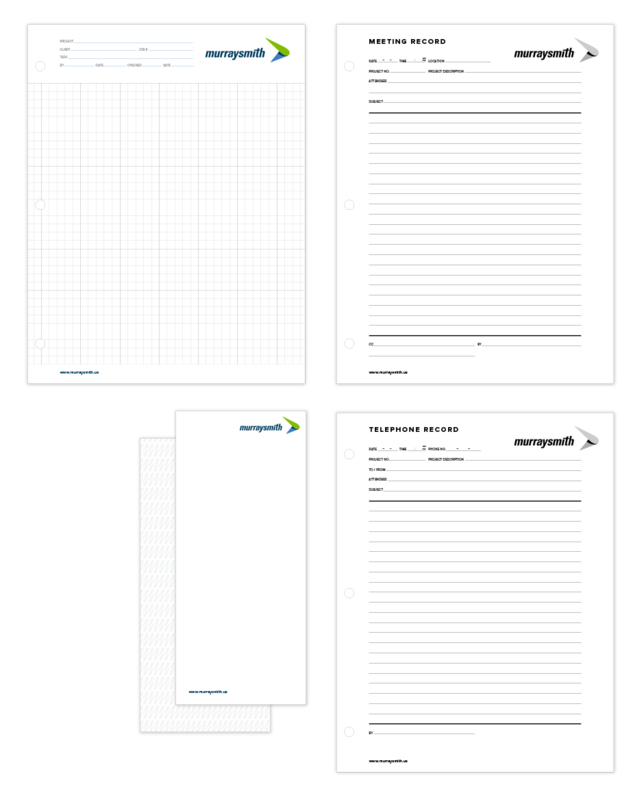 When the design works as a business card, it will be successful on other brand touchpoints including the entire stationery system. All employees receive their business cards with three different backs to honor the Three Uniques. 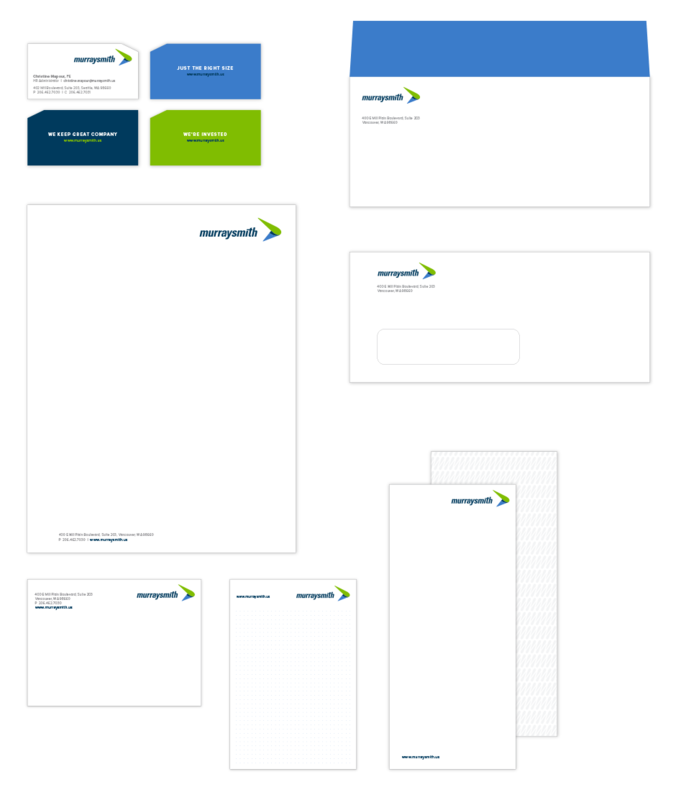 The cards are efficiently smaller than conventional business cards because Murrasymith isn’t a conventional firm. 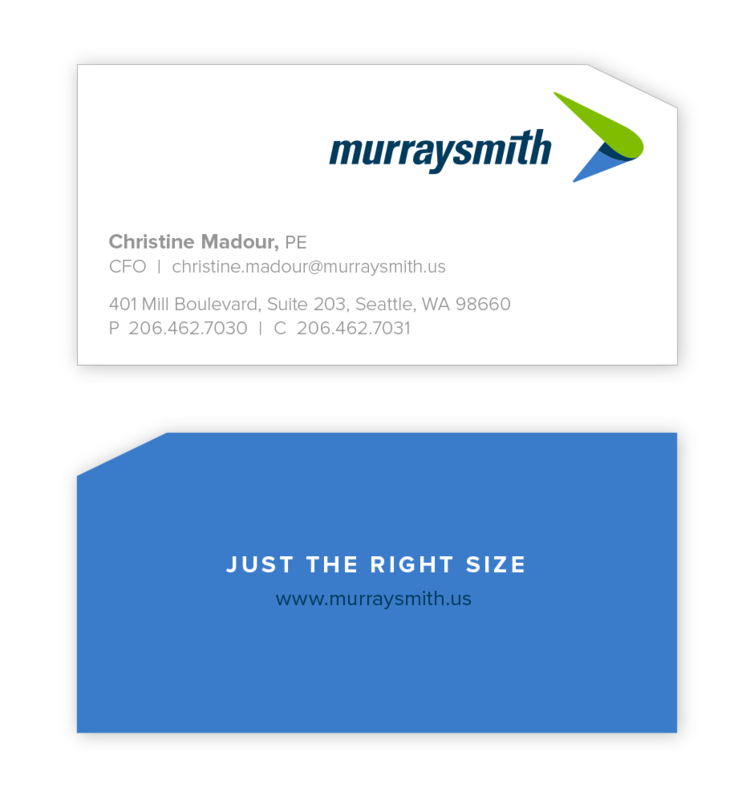 Upon receiving the new card, a prospect, might remark, “that’s an interesting size for a business card.” Murraysmith staff can then proudly reply, “actually, it’s just the right size” with a wink, while handing out the version of the card with “Just The Right Size” on the back. 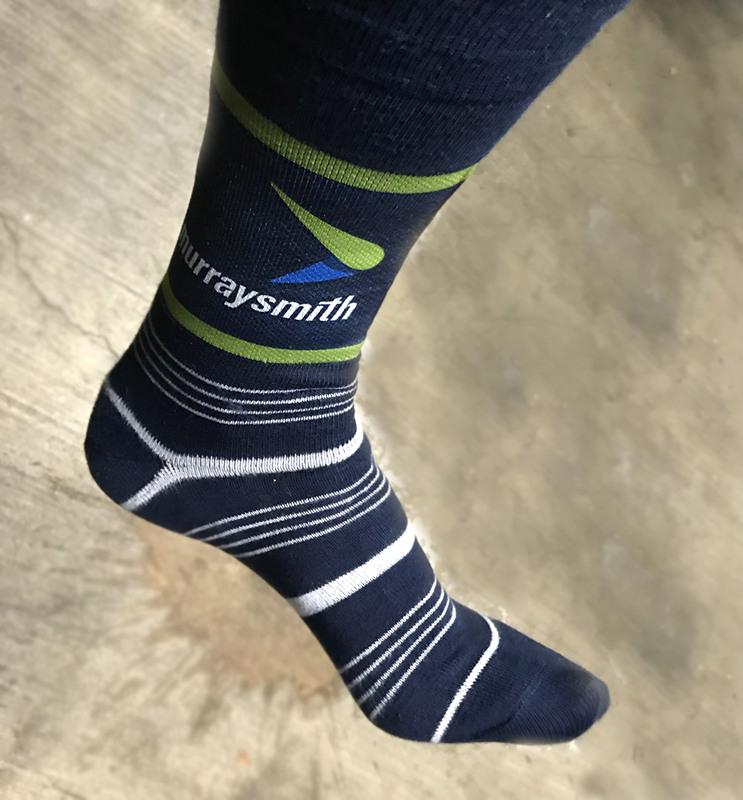 Employees can then explain how Murraysmith is Just the “Right Size,” or “We Keep Great Company,” or “We’re Invested” depending on the context of the previous conversation with the person receiving your new card. If unsure about which version to hand out, we recommend letting the recipient choose in playful “pick a card, any card” banter. 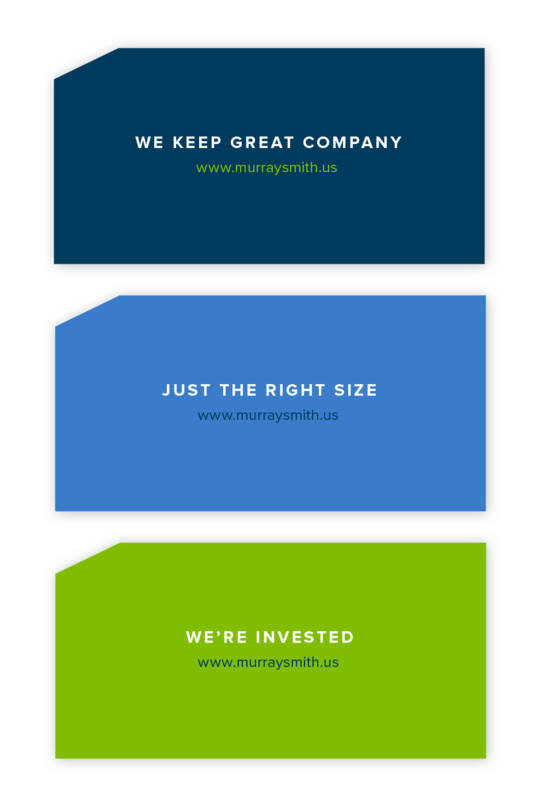 For simplicity, memorability, and consistency with the new brand name, the new URL is www.murraysmith.us. The previous URL www.msa-ep.com automatically redirects users to the new URL and website. Go ahead, try it! 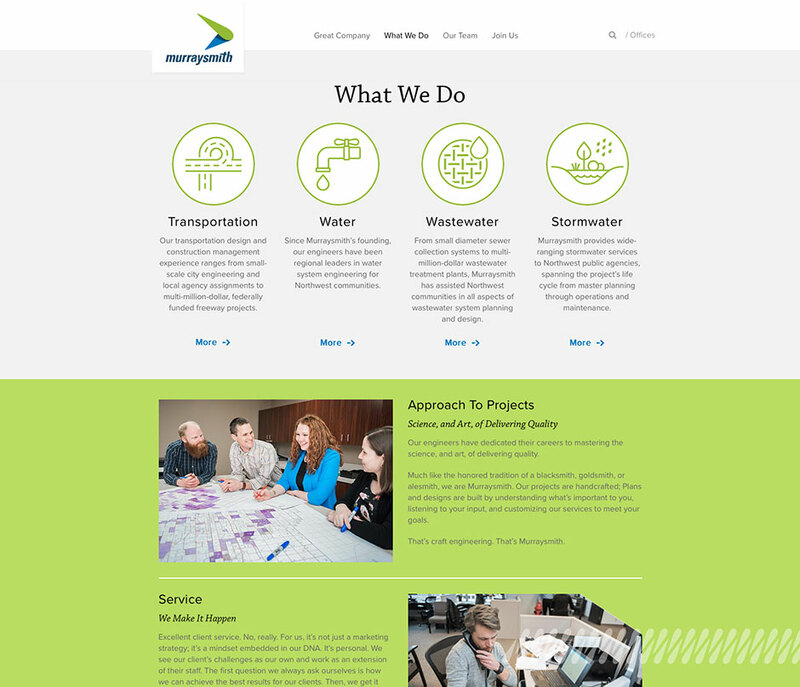 What We Do – Features our four services, each represented by a new icon. 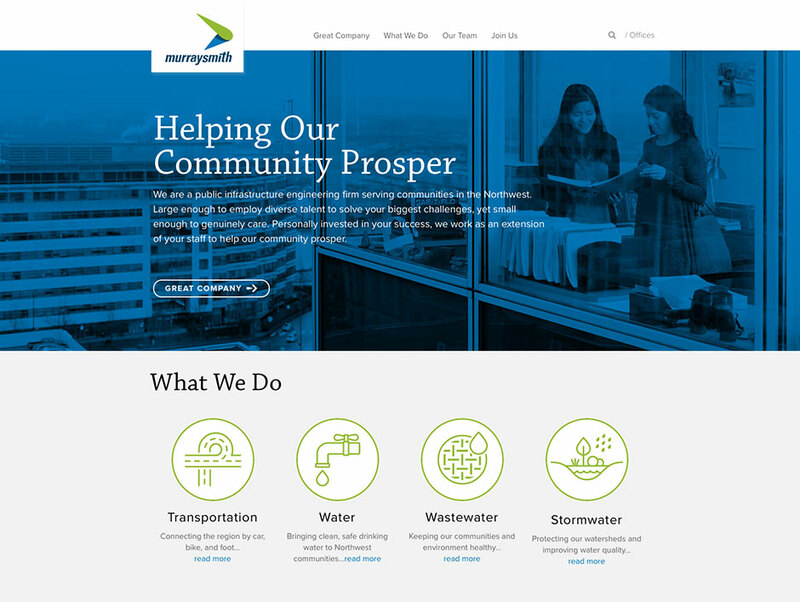 Six “hero” projects for all four services are displayed prominently. 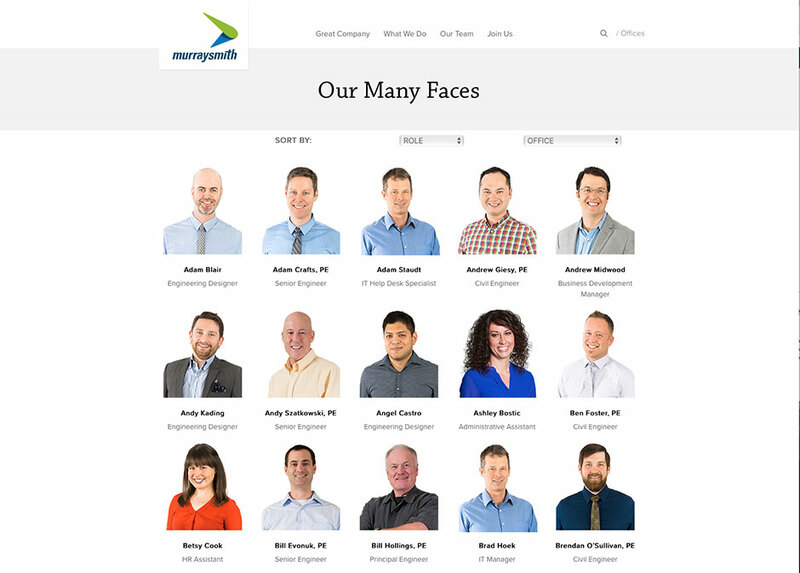 Our Team – Since We Keep Great Company, all 129 Murraysmith employees have their own page on the new site. Join Us – True to our original reason for rebranding, to attract great talent, the “˜Join Us’ section contains useful information. 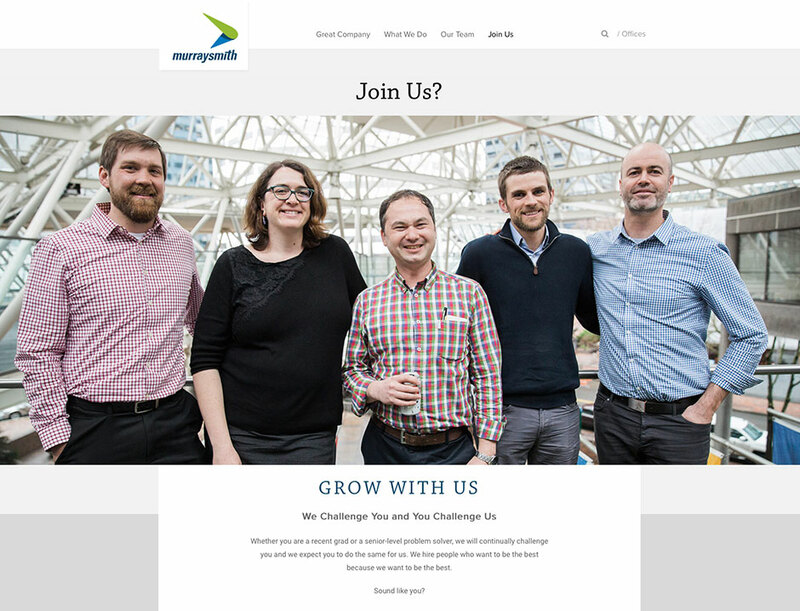 Potential hires can learn about our application process, the work we do, our 3 uniques, diversity, why work here, benefits, our 8 locations, and of course, job openings. The tradeshow booth is designed as a simple and bold brand background to complement the human activity in the foreground. The booth is imaginative (less is more) and relatable. It utilizes bright, optimistic colors to attract. Instead of the bullet point lists and small project photos of our previous booth, we prefer to let our people in the booth tell our story. 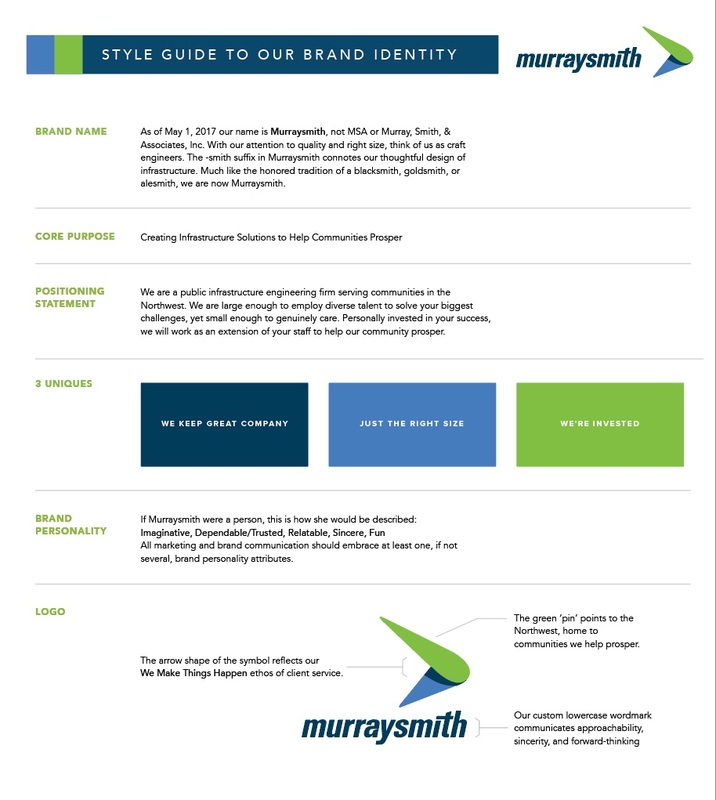 The Murraysmith Marketing Department appreciates the Brand Style Guide because it helps maintain consistency across the eight offices. It also transfers the brand elements and their guidelines, empowering the marketing department to take ownership of the brand for ongoing communication needs. An often overlooked, but critical, component of launching a rebrand is first building support within the firm. Having an entire firm of brand ambassadors to evangelize the firm’s message is considerably more effective than the marketing department working alone. Two and half months prior to the May 1 launch date, I fly to Portland to present at an all firm meeting. Employees travel from all eight offices to take part in a half-day Strategic Plan Update. 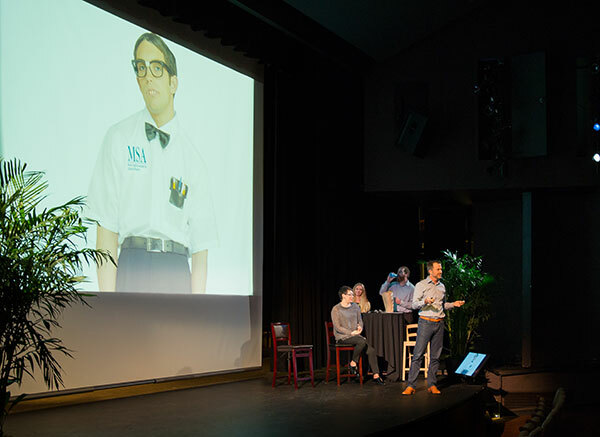 The Marketing Department and I are onstage in an auditorium sharing the why and how of our rebranding project to date. We present the brand strategy and unveil the new logo and website preview to the entire firm. Change is scary and we know that not everyone will instantly love the new branding. But we ask everyone to trust the experts and prioritize the good of the firm over their personal opinion. 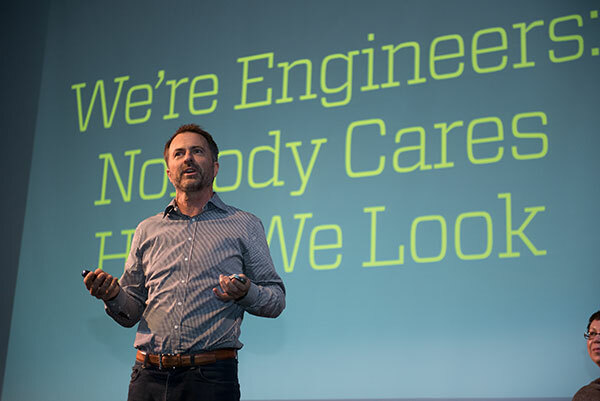 Why do brands matter, can’t we just do great work? 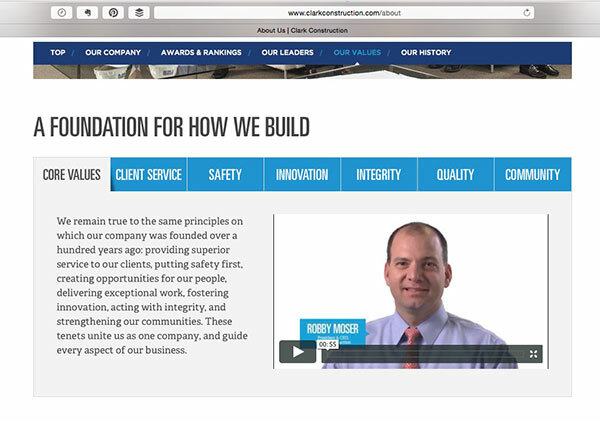 As of May 1, what will be new about our firm? What can I do to support the rebrand launch? Where do I get the new logo files? What do I do with my old business cards and collateral with the old logo? What do I have to do to use my new email address and signature? How is the rebrand being communicated to our clients? On May 1, do I do anything differently? 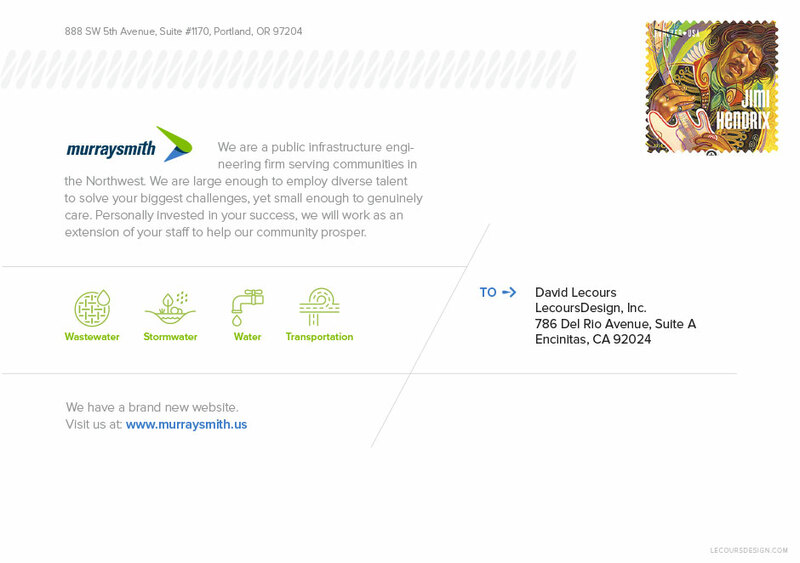 To reinforce the email message, we mail the postcard below to past and present clients. 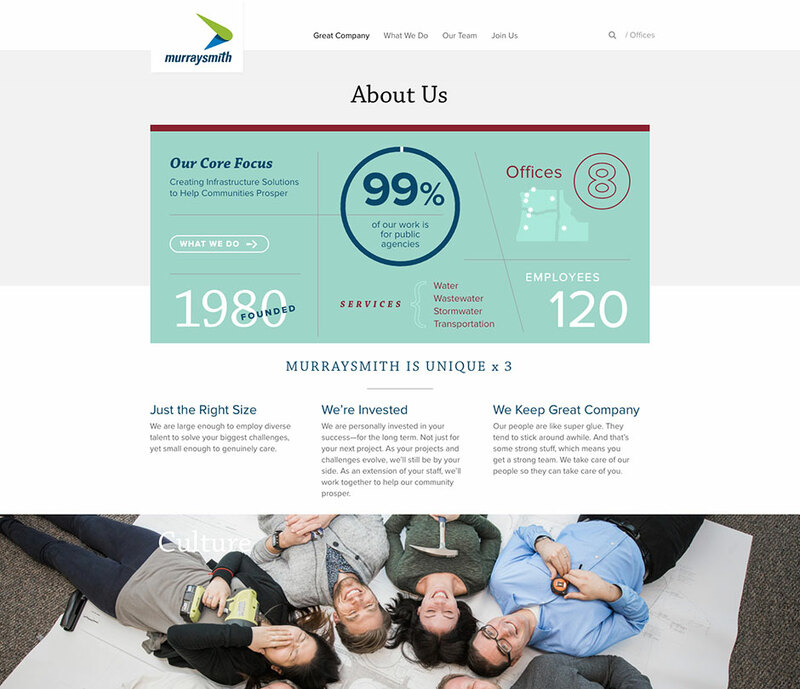 The Murraysmith rebrand launched May 1. 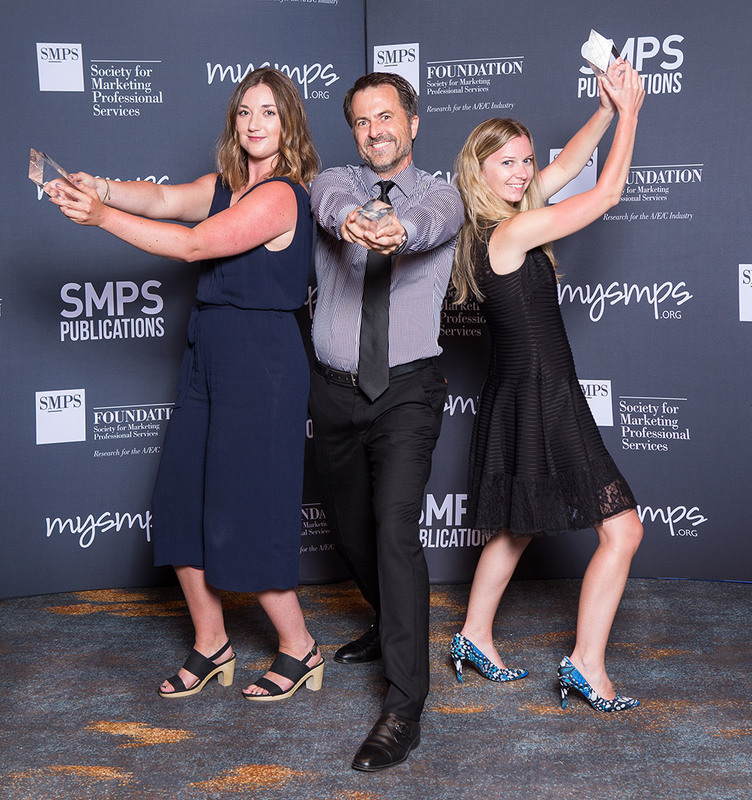 LecoursDesign/Murraysmith were honored for three national awards at the 2018 SMPS Marketing Communications Awards (MCAs): best rebrand, best website, best recruiting/retention promotion. In terms of memorability and messaging, most A/E/C firms have terrible brand names. Firms named after founders can be problematic if difficult to say or spell, and challenging for ownership transition. Acronyms are even worse. Lost in alphabet soup, they are neither memorable or distinctive. I chose to interview Leslie Young, Assoc. 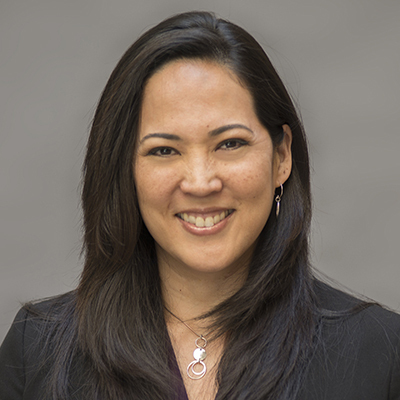 AIA, LEED AP, CDP because her firm recently renamed using a metaphorical name, STIR Architecture. Having a great brand name is an indicator of progressive marketing. I am Associate Partner and Director of Strategic Development leading Marketing and Business Development. Known for both large-scale, complex mixed-use projects in the United States, Europe and Asia, as well as a boutique portfolio of adaptive reuse, institutional and transit work, STIR has offices in Los Angeles, Amsterdam, and Manila. I am one of two Associate Partners and 3 Partners who were ultimately the decision makers for the renaming of our firm. The firm was founded in 1984 by Ronald Altoon and James (Jim) Porter, so we started out as Altoon & Porter Architects. In 2012 when Jim left the firm, we updated our name to Altoon Partners. When Ronald left the firm in 2015, we saw an opportunity to rename the firm as something not directly tied to partner names. In 2016, we reintroduced ourselves as STIR Architecture. Since the firm’s founding, the intent was always to create a legacy firm with a formal ownership transition plan. The remaining partners have been at the firm for 30 years, on average. There was a little bit of “I’ve earned the right to have my name on the door” thinking, so we did initially consider the typical acronym of using the first letter of each partner’s name. But we discovered fairly quickly that DSA, ASD, DAS, ADS, SDA was not going to work for us. But mostly, we didn’t want to go through the naming process again if one of the partners leaves. We thought it was an opportunity to come up with a fresh name that better describes who we are. Many of our newer staff had never worked with our founders, Altoon or Porter. While our values and practice hasn’t changed dramatically, we wanted to evolve the firm with a new name that everyone could embrace as their own. For about five seconds, we thought we could do it ourselves. But we quickly realized we needed an expert and a referee. We also had a strict deadline ““ attendance at our largest annual domestic tradeshow. We hired WOW Branding to keep us on schedule. Also, working in foreign markets, we needed their help with a name that translated well into other languages. We had conference calls with our consultant and the five decision makers. Some lasted as long as six hours. 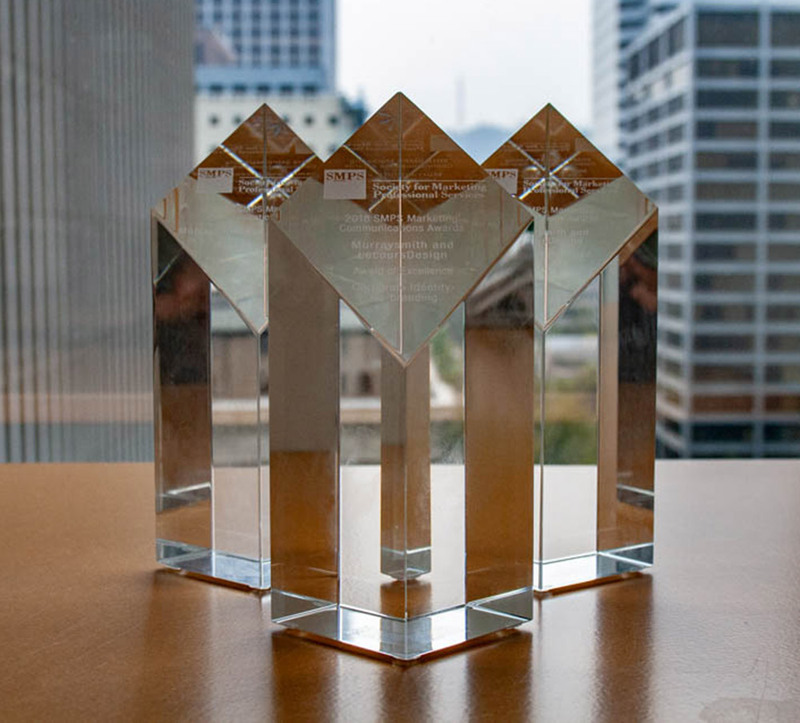 We reviewed our Mission, Core Values, and prioritized goals of the firm. The strategy has to come first. Next, our consultant presented a long list of about 50 names, which we edited down to 8-10, then ultimately 5. From these 5 finalists, they did availability research and some basic design treatment. We had two real favorites, one of which we ultimately decided could cause us intellectual property problems. Ultimately, we decided on STIR Architecture, which we are very excited about. 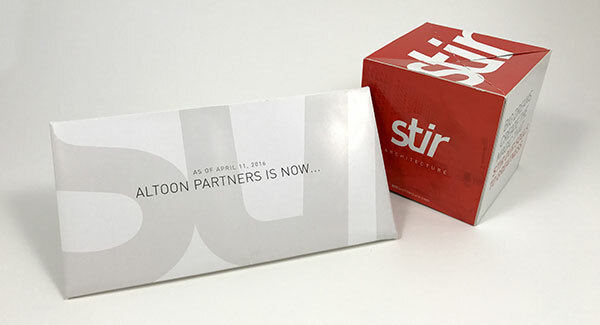 We love that stir is a verb, as in “stirring things up.” We like to tackle new design challenges. Our work also “stirs” the emotions of users of our buildings. STIR refers to how we practice””complex projects with many stakeholders and multiple team members. 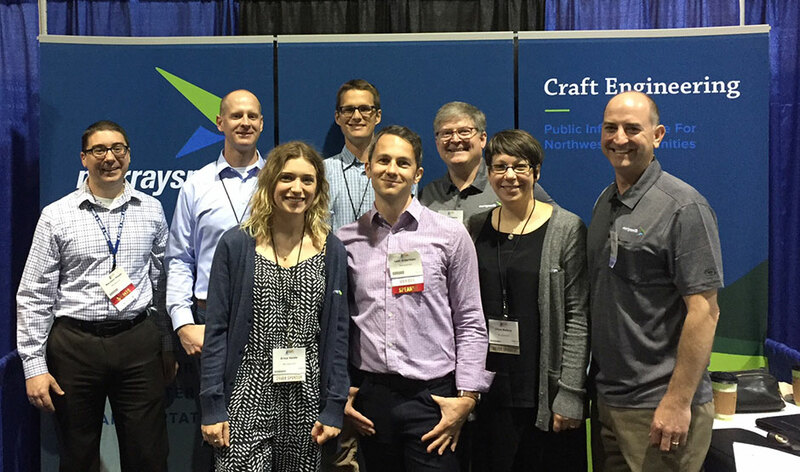 The energy of our new name appeals to us, our staff and our clients. It is forward-focused. It reflects who we are, what we do and what people expect of us. Our name is our promise. We distributed press releases stating that as of April 11, 2016, our new name is STIR Architecture. These included sharing our strategy of developing the name and what the name means to us. We followed up with a direct mail promotional piece (see below) to 600 people on our mailing list. Since we didn’t have physical addresses for everyone, we supplemented the direct mailer with a 2500 person email announcement. We chose not to reference our previous name in a tagline or as a transitional device. We went all-in with STIR. 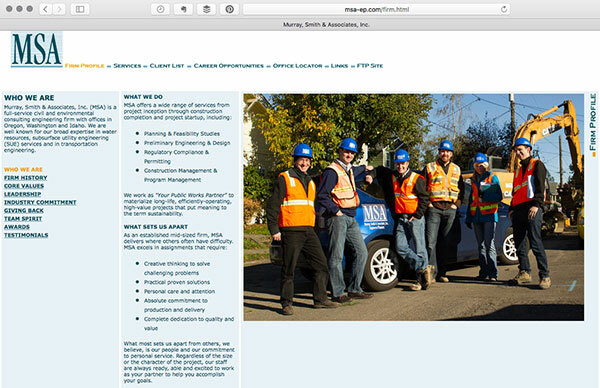 We still own all our previous URLs, so if a user inputs an old website address, it will automatically redirect the user to our new site at stirarchitecture.com. We continue at every opportunity to reconfirm our brand through direct mail, social media, press releases, advertisements, etc. Consistent reinforcement of our brand at every turn has been a priority. Give yourself time. On one hand, it was good that we had a strict deadline to get the name done by, but it caused a lot of stress. Keep in mind that getting the name done is really just the beginning. 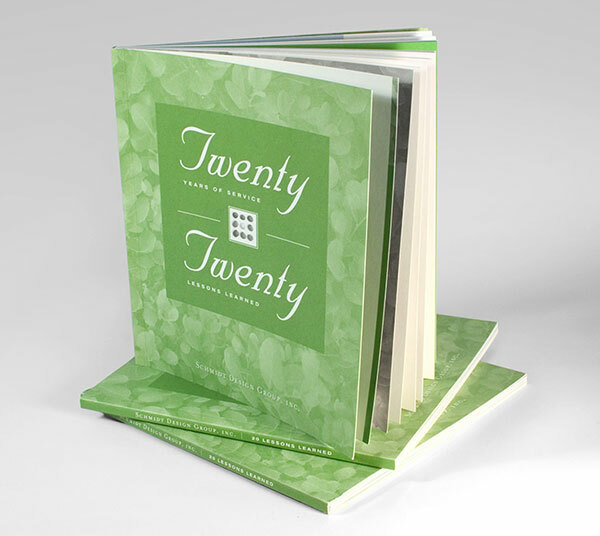 Then you have to develop a new logo, visual branding tools, marketing collateral, and website. 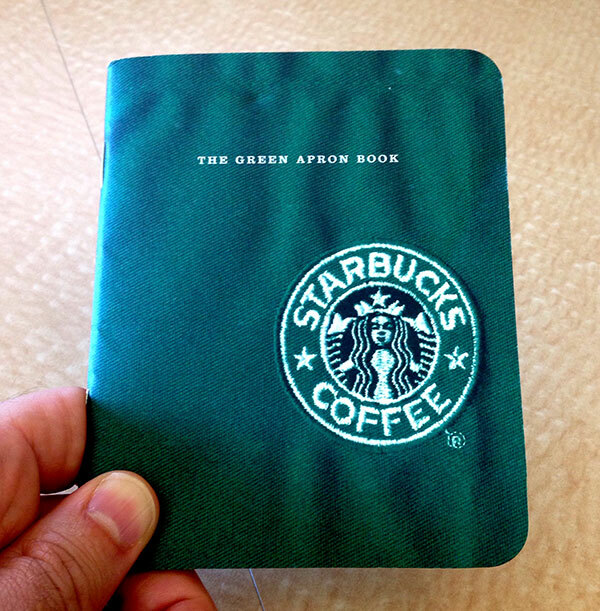 Also, having a formal program in place to keep reinforcing the brand moving forward is key. In general, I recommend other firms dream big, be bold. As long as you are consistent in continuing what has been successful for the firm in the past, clients will continue to follow you. In start-up mode, most firms, unfortunately, put little thought into the firm name. The sole focus is bringing in any project that pays the bills. Moving out of childhood and into adolescence, firms should start to think and act for themselves, developing a distinct point-of-view. 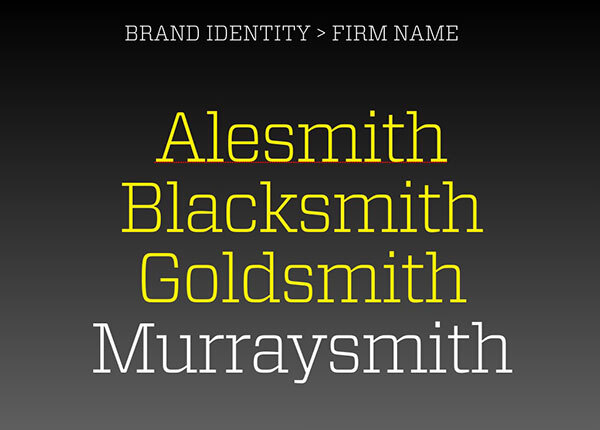 If not done previously, this is the time to develop a distinct brand name that reflects where the firm is headed, not where you’ve been. Renaming isn’t easy””few things of value in life are easy. As Leslie and STIR Architecture have shown, with the right approach, a small focused team of decision makers, and an expert guide, success is attainable. Past clients will continue to work with you and future clients will gain a favorable first impression. You probably don’t think of your email signature as a valuable brand asset. But you should, and here’s why. If your firm has 100 employees, that’s 1 million annual brand impressions. Not just random impressions, your emails arrive targeted to clients, vendors, teaming partners, and potential employees. 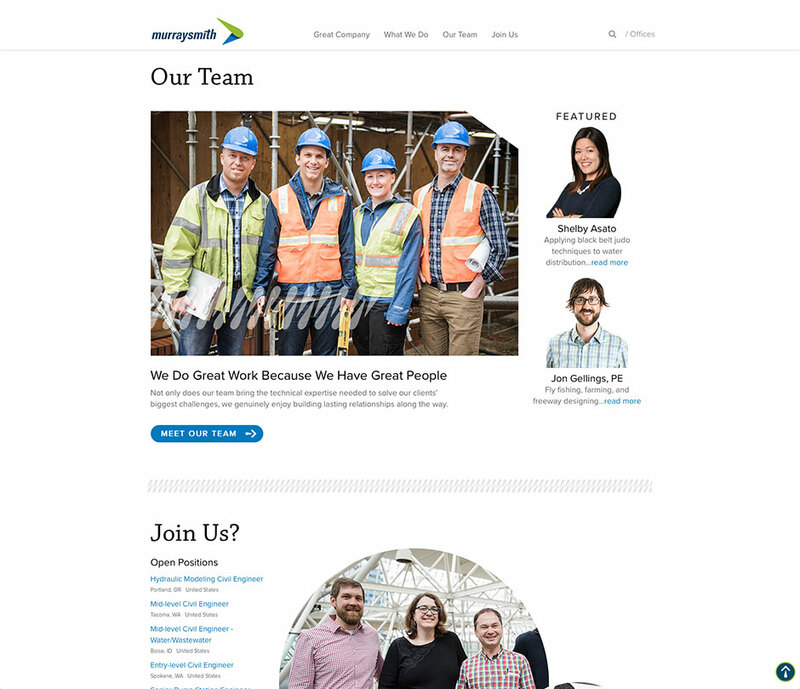 Consider improving email signatures across your firm beyond an obligatory formality. Email signatures are the most prolific brand touchpoint you own. To help you, I’ll identify common email signature mistakes. Then, I’ll share how to create a powerful email signature that enhances your firm’s reputation. Email signatures aren’t the place for personal expression. 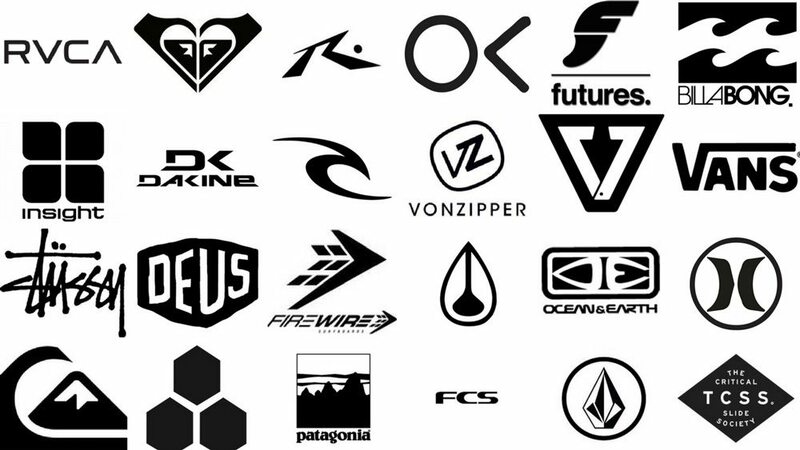 You don’t allow each employee to craft their own version of your logo, so don’t allow it with email signatures. 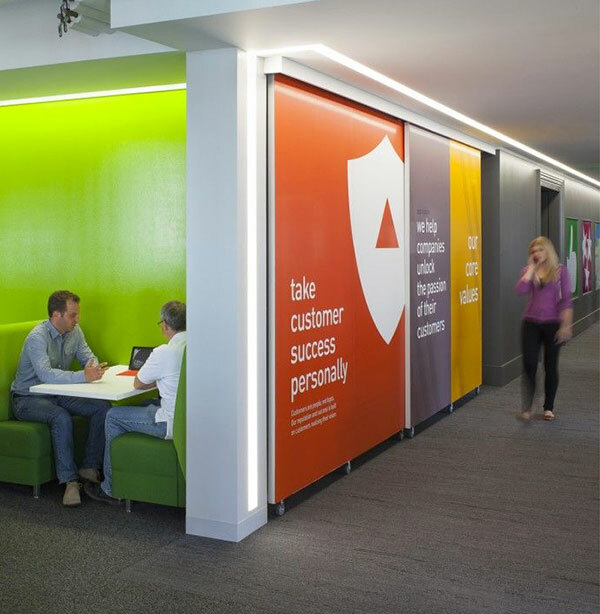 All your brand touchpoints should speak in a consistent, professional voice. Avoid including company logos, social media icons, project photos, and charity logos. Images in email signatures can flag your email as “spam,” sending it directly to the Junk folder. Plus, it is annoyingly difficult for email recipients to decipher your intended attachment files from your email signature image attachments. If someone receives an email from you, by default, they now have your email address. Including it in your email signature is redundant. If they want to reply to your email, guess what, they will hit “reply” within their email software. Don’t impose your personal beliefs in a professional setting. You know the ones, similar to seen on faxes circa 1989, stating “this email is only intended for the recipient…blah, blah, blah” Since these have become so banal, nobody reads them. As a result, they become ineffective within a legal setting. Be respectful of your reader’s time and visual landscape by making your email signature as concise as possible. I recommend using grey, or a quiet color, to distinguish between the email signature and the body of the email. I also use the dotted lines to separate the signature from the body. For consistency across your firm, create a master template of your new email signature. Then copy and paste it into an email sent to your IT department, or each employee, for implementation. Obviously, each employee should replace your individual contact information with their own. Your firm’s reputation is the sum of all experiences a person has with your brand. Since email signatures make millions of impressions, show that you care about your reader with a simple, consistent and well crafted email signature.